“Britain As It Was Devided in the tyme of the Englishe Saxons especially during their Heptarchy. Copper engraving published by John Speed, 1616. With fourteen side border vignettes illustrating seven of the earliest Saxon kings (between AD 456 and 582) on the left and their successors (595 to 662) who converted to Christianity, to the right. The forcible nature of the tactics depicted on two of these vignettes give the impression that the conversion was hardly voluntary! 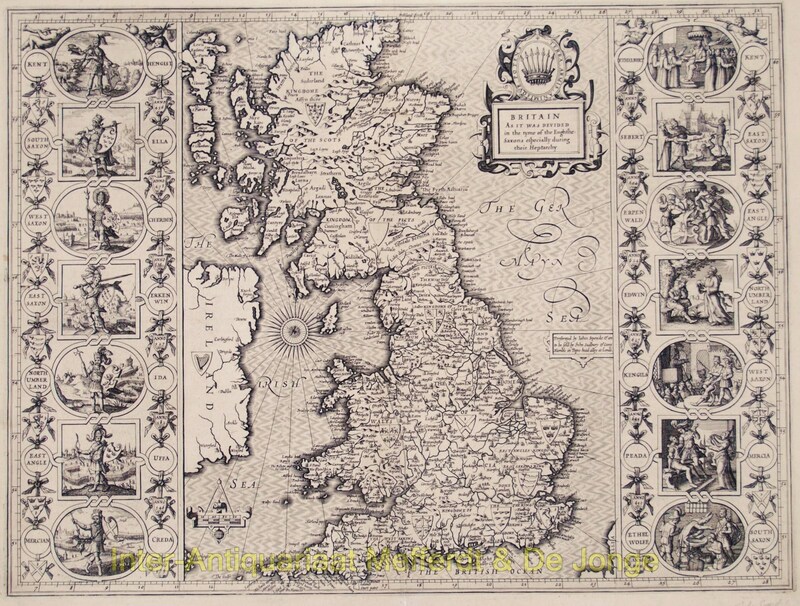 Superbly decorative, it was copied by both Blaeu and Janssonius for their British atlases in the 1640s. Size: 38,8 x 51,7 cm.